Micro adventure: a brief break from your routine, often done in the evening hours between when you quit work for the day and arrive back at the office the next morning. You're a little tired at your desk the next day, but it's absolutely worth it. The concept has been growing globally thanks to adventurer Alastair Humphreys, who even wrote a book about it. Last summer we showed you have to plan an overnight local island kayaking micro adventure, and had Vancouverites share photos of the micro adventure that we inspired them to take. 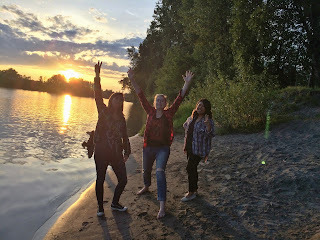 It had been too long since our last micro adventure, so we went on another one, this time an "Urban Camping Trip" to Brae Island in Fort Langley. 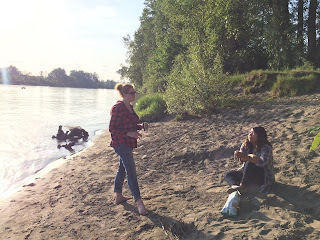 On an otherwise typical Tuesday, we brought all our camping gear to the office, threw some ice and ciders in a cooler, and as soon as our work for the day was done, we piled in a car and drove out to Fort Camping on Brae Island in Fort Langley. 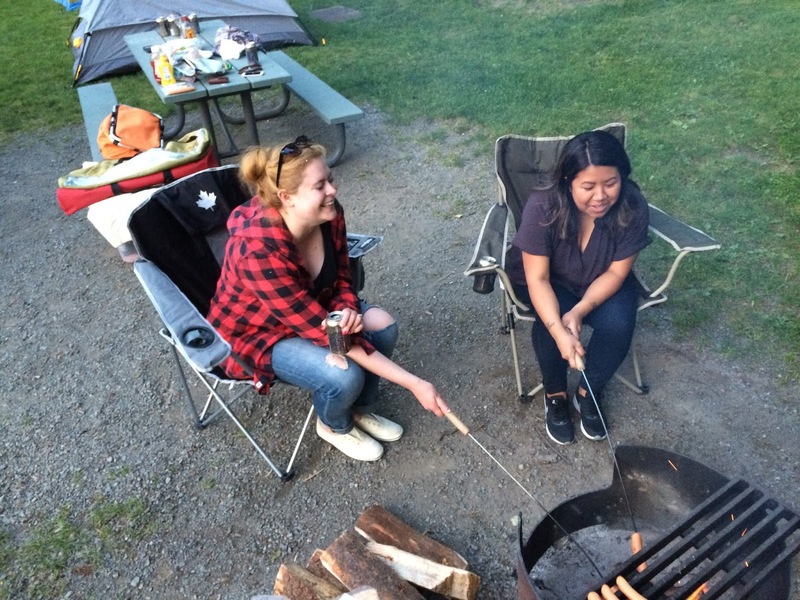 This regional park is home to both a day-use area and a full service campground. Trails lead along the river's edge and through open forests of tall cottonwood trees to lookouts with views of the river and mountains. We arrived, set up our tent and headed out to explore the area. The campsite includes an outdoor pool (which opens the May long weekend!) Heading down to the beach, we enjoyed the river view and watching young paddlers in their kayak lessons. After watching the sun set across the water we walked back to our site to partake in all the usual camping rituals of smokies, s'mores, and late night conversations around the campfire. 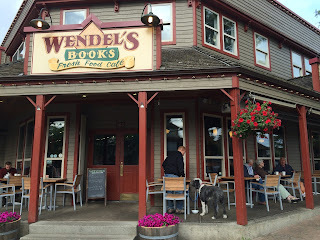 Waking up early the next day (partly due to nature sounds, partly due to train sounds), we packed up and headed up the street to the jewel of Fort Langley, Wendel's Bookstore and Cafe. With full bellies and a delicious coffee in hand for the road we set out back to work for the next day and were back at our desk at our regular business hour. If you're never been camping, Brae Island is a super easy site to get your camping feet wet as it has many luxuries and is close to Fort Langley for anything you may need. Micro adventures are not difficult to put together, especially in our city. Find a close by escape, grab some friends, and create a memory. Life is more than just staring at computer screens. Press pause and go play. If you plan your own micro adventure, make sure to share your photos with us, we'd love to hear about it!